What a great day for a BBQ! 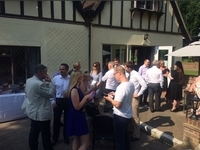 30 members guests joined together yesterday to enjoy networking in the sunshine over a glass of Pimms and some fabulous food at this year's Annual BBQ held in the delightful surroundings at Great Hallingbury Manor. Special thanks to Andrew Vales, the new General Manager at the venue and his team for such a wonderful afternoon - well done to all! Heather Benham of Enterprise Europe Network " #Stortford great Sunny afternoon @stanstedchamber #summerBBQ thank you ?" 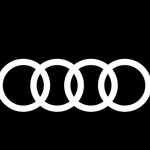 and continued "Thank you Julie Budden lovely to catch up with everyone, great networking , super BBQ and really lucky with weather"
Andrew Morgan, Director of Marketing at Hidentity UK "It was a very enjoyable and worthwhile few hours. Many thanks for the invitation ?" Val Hopkins, Novotel "Thank you Julie Budden. The balmy heat of a quintessential English summer afternoon, BBQ and Pimms added to another valuable networking event". Paula Tatchell MIRP, Spun Candy "A great afternoon networking event, thank you Julie Budden!" Paula Hine - Infusionsoft Consultant "Loved it - great food, great company and Pimms :-) "
Your support is very much appreciated and goes a long way to helping this worthy cause. The SACC have teamed up with fellow Chambers of Commerce and Business Networking Groups from around the region and we are delighted to bring you this unique event to help promote your business to a wider audience and provide the opportunity of increasing your business contacts. Why not join us and network with likeminded professionals before the presentations and continue over a light buffet and refreshments at the end of the session. We’ll have a room of businesses ready to get connected with YOU and YOUR business – all you have to do is get the date in your diary and book a place! Meet the Neighbours is open to all, but booking is essential. This is perfect for anyone who wants to raise their	profile across the business community and extend their network of business contacts. We will have business people ready to get connected with you and your business – all you have to do is get the date in your diary and book a place today! Bookings close Friday 17 March and places are limited. Includes light buffet and refreshments. We were delighted to welcome Andrew Cowan, CEO from London Stansted Airport to our 2016 Annual Christmas Lunch at the Hilton London Stansted. 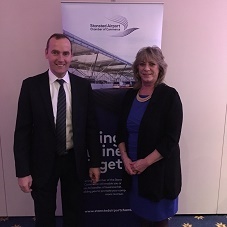 Andrew addressed guests giving an overview on updates and developments at Stansted Airport and plans going forward and was happy to answer questions from guests. The lunch which was a great success and welcomed many new faces providing the opportunity for all to make new business contacts whilst enjoying the festive mood of the afternoon. We are pleased to announce that at the 2016 Christmas Lunch members and guests raised £300 for the Essex Retired Police Dogs Fund, our charity of choice for 2017 - thank you to all who donated. 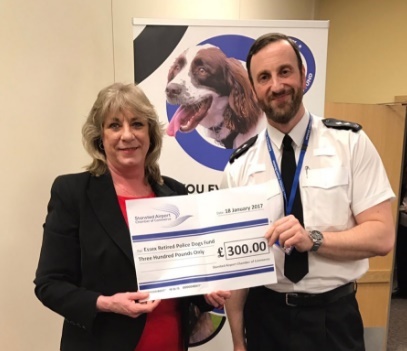 Earlier this year at a networking event with the working Essex Police Dogs and their handlers, Insp Lee Devall who is based at Stansted Airport proudly received the monies on behalf of the Charity. Linda Belgrave, Chair of ERPD said: "We are delighted to receive this cheque from the Stansted Airport Chamber of Commerce and are extremely grateful to Julie Budden for organising the fundraising event. Essex Retired Police Dogs Fund relies on such donations so that we can support Essex Police Dogs in their retirement. 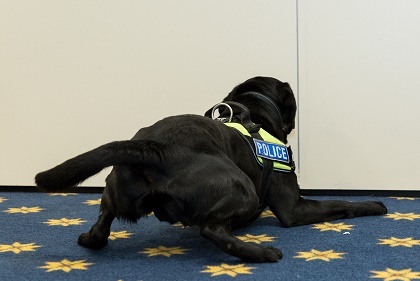 When a police dog is retired they are no longer the responsibility of the police - they do not receive a pension and all expenditure must be met by their owners. 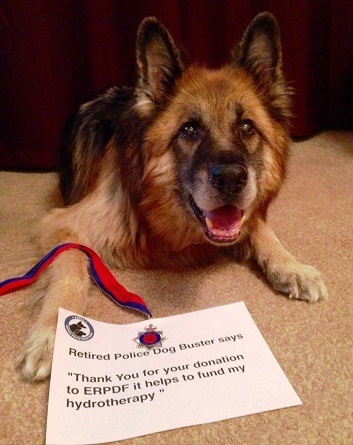 Essex Retired Police Dogs Fund aims to contribute towards veterinary and healthcare costs. These exceptional dogs have protected the people of Essex during their service and we are pleased to be able to assist them in their retirement. Although we are completely independent from Essex Police we are always grateful for their support and especially today as Insp Lee Devall kindly accepted the donation on our behalf". 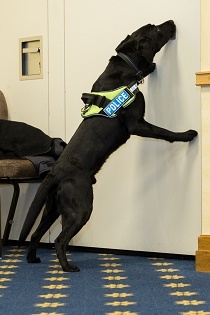 We were pleased to welcome PDs Razor, Milo and Danny alonside their handlers Sgt Paul Screech and PC Jim Beaird from Essex Police to a recent networking event at the Hilton London Stansted. 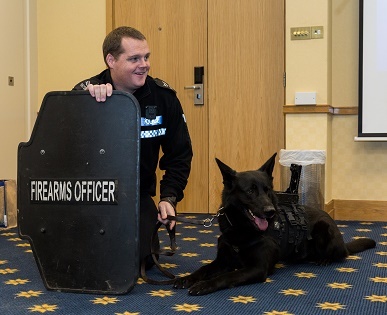 Attendees were treated to a display of some of the K9s skills and heard how the Essex Police Working Dogs team helps in reducing crime in the community. 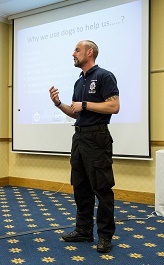 In a talk led by PC Jim Beaird and Sgt Paul Screech, the attendees learned about the process of selection and the rigorous training process that the dogs go through. Our three K9 visitors who live with PC Beaird and Sgt Screech, create a strong emotional bond. "You get very attached to them," explained PC Beaird. "They're completely different at home to how they are when they're hard at work. You end up with no back garden, of course! "They are fantastic guide dogs, though." PC Beaird explained how some of the dogs are donated to the Force by people that find they are very inquisitive and too energetic to be taken care of in a normal domestic environment. "These dogs will literally chase a ball around all night long, so often owners find that it's just too much. "We've had fairly mixed success with donations. 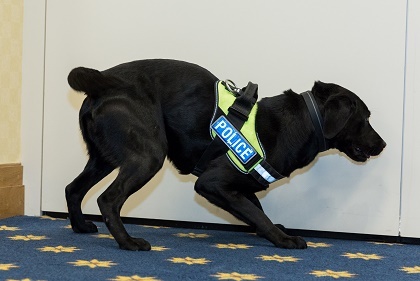 Sometimes they turn out to be fantastic workers, others just aren't cut out to be police dogs. But as I say, we're always extremely grateful for donations!"